Went to the rowing club early for a 8am weights session. We did a row in the double at 9. 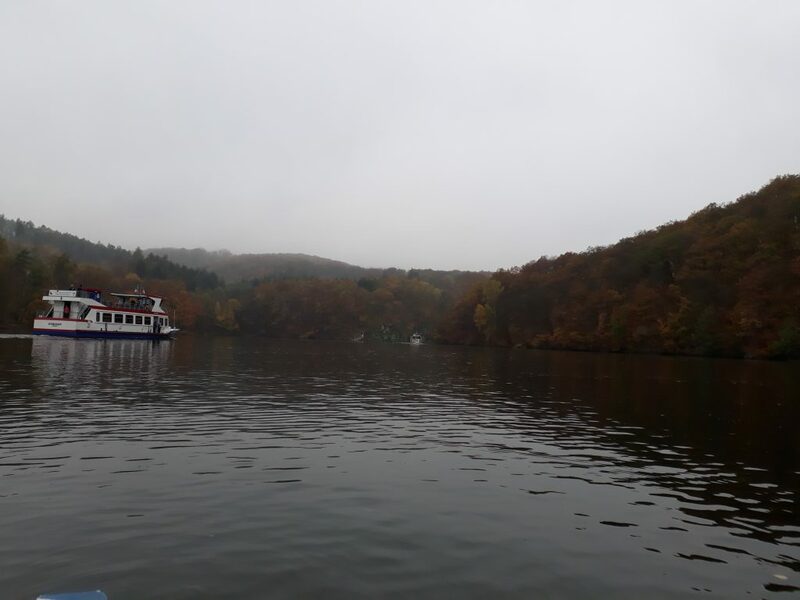 It was a short row, because the weather deteriorated. We did various technique drills and a few practice starts. Another beautiful and sunny day. Romana and I went to the rowing club immediately after breakfast, to avoid having to row in the middle of people renting kayaks or pedalos, with no clue of traffic patterns. We found that the wind direction had changed to North wind again, but there was hardly any wind. The lake was mirror flat, except from a bit of wake from the Rescue Service. 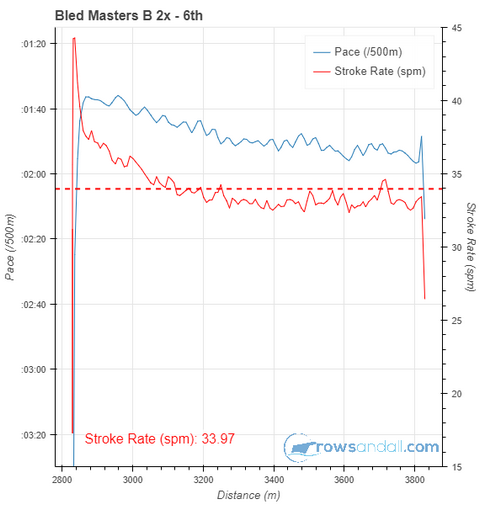 We deciced to take the stroke rates down a little. Our 1k racing takes a little over three minutes, so I couldn’t imagine us doing 6 of them, followed by three 1 minute efforts. Also, we need to row together and we haven’t been above 24spm this year. So I rowed the 3 minute pieces around 28spm. In the final 1 minute efforts, we did them at 32spm, then 32-33spm, and then I told Romana that we should do the final one at not higher than 33spm, because that is high enough. About fifteen seconds after I said that, I started the piece at 34spm, increased to 35-36spm and kept it like that. It was a great row. A shower, and then a coffee on the bench in front of the club house, overlooking the lake, listening to birds’ songs. There is nothing wrong with our boat speed! In the double with my wife Romana. The first row in 2018 and it was great. 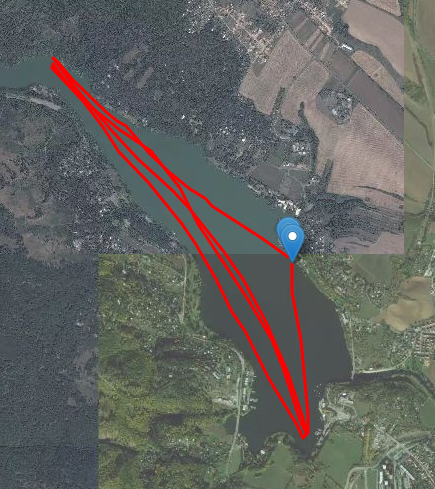 The water was mirror flat when we launched, but degraded slightly during the training. 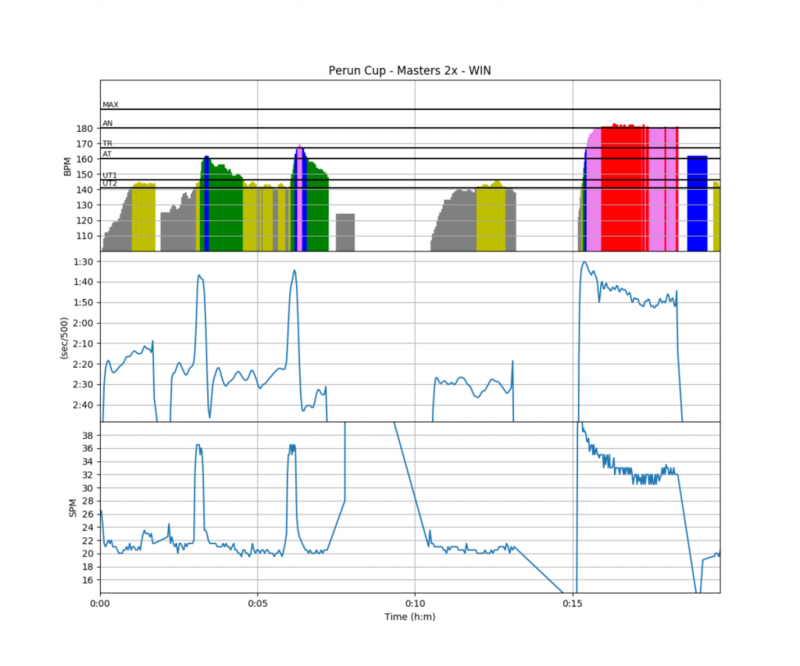 We did technique drills at low spm and then we went on to do a rate ladder. The boat was moving nicely and lightly, so the next lake length was another rate ladder, but going a bit higher. We ended up at 24 spm and enjoying ourselves greatly. Almost 12 km in a little over an hour. I haven’t exercised in a while. I returned from my business trip to Egypt feeling well and happy that I didn’t get the food poisoning that they had warned me about. 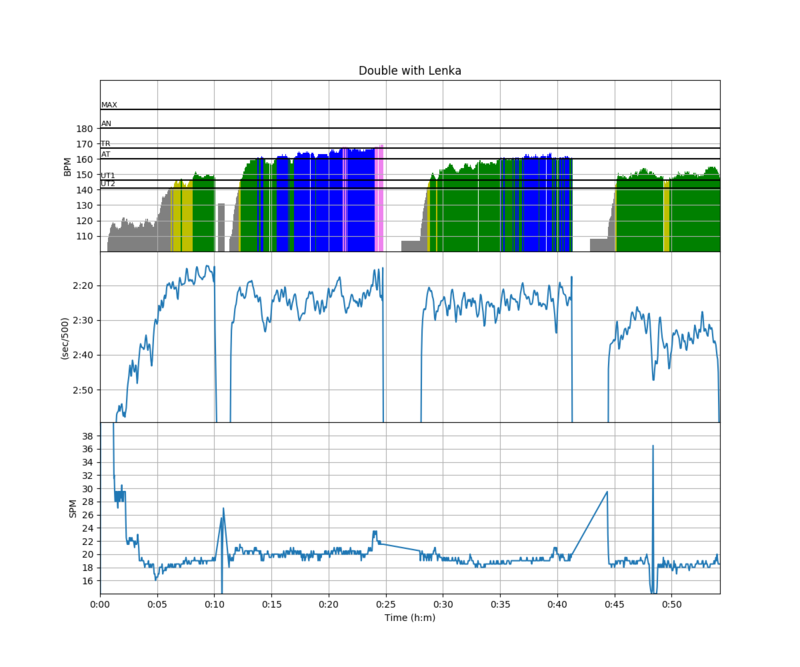 On the evening of my return trip, I did a steady state row on the erg, but I stopped after 30 minutes, because Romana came home and I wanted to greet her more than I wanted to exercise. Then the misery started. The next day, on Friday, I am having lunch with my team and all is well. An hour later, I visit the bathroom and get a nasty surprise. Another hour later, I am not feeling well. Feeling feverish. I decide that I need to drive home as soon as possible. I spend the rest of the day at home, on the couch, under a blanket, feeling miserable. Terrible headache, belly not good, and fever. I did manage to drink 2 liters of disgusting salt/sugar water mix that I made for myself. Over the course of the weekend there are ups and downs. I am now eating only light food. After every meal I have to lie down for an hour because of belly cramps. I start taking activated charcoal pills. It seems to slowly get better. On Monday, I work from home. On Tuesday, I feel strong enough to go to work. All seems well. 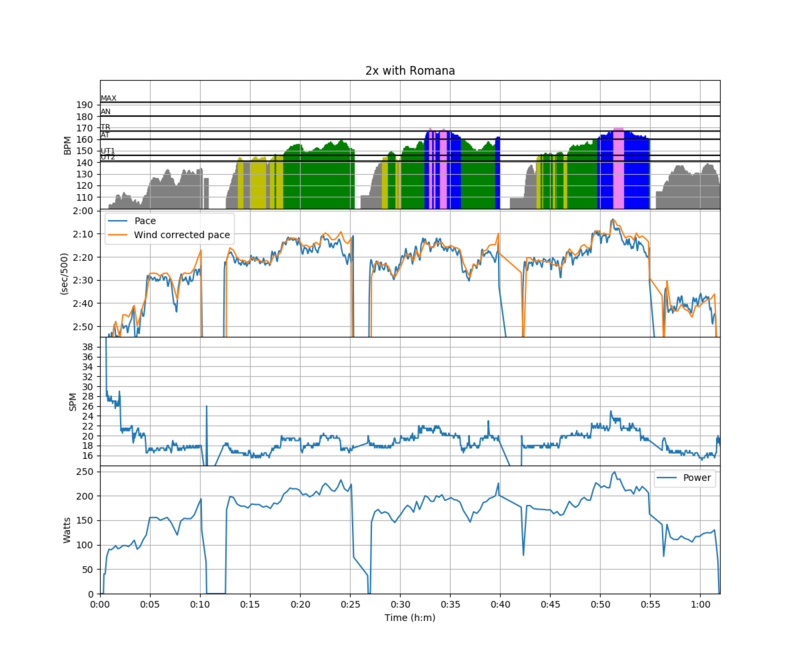 On Wednesday, I am packing to go to Sofia, Bulgaria, but I am on a 45 minutes fine, 15 minutes of terrible cramps interval session. That lasts the entire morning, and I decide to take the chlorine containing pills that claim to clean my intestines leaving the good gut flora alive. I depart to the airport, telling myself that if things get worse, I can always turn around before boarding and just go home. But this is an important trip. My situation improves and I make the trip fine. Friday, I am back, and it’s ups and downs again, but more ups than downs. 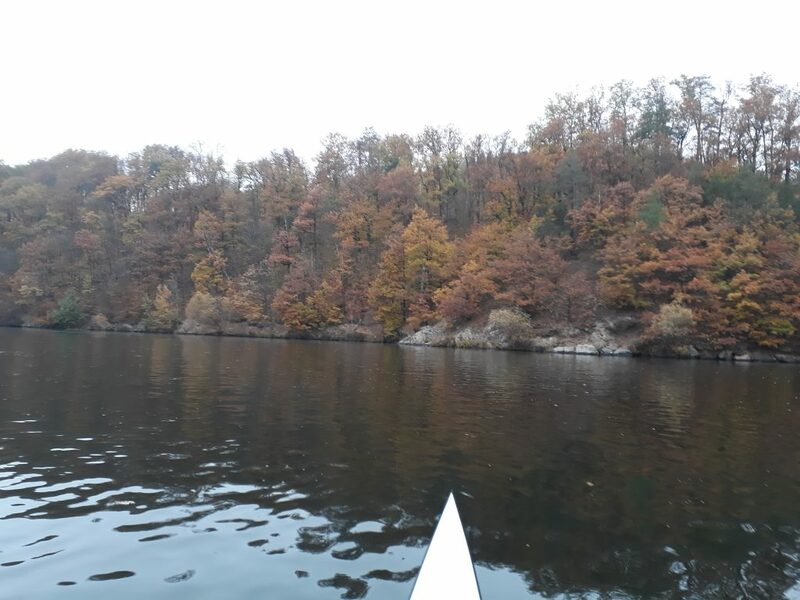 Today, Saturday, I even dared to take out a boat and row. I took our double together with my daughter Lenka. It is good to be back among the living. Now I urgently need to review my training plans because ten days of travel and being sick does have an impact, and I think I should ramp up slowly and carefully. I was really longing for a day to sleep in, but Saturday was not going to be that day. Alarm clock at 6, picking up boat trailer at 6:30. Thus was slightly more complicated than anticipated, as someone proactively locked the cupboard with the keys to the coach’s office, where the minivan car keys are kept, and when we solved that, we couldn’t find the adapter for the electric outlet of the van. So I ended up towing the trailer with my own car. As there were just three singles on the trailer, It wasn’t hard, and at 9:30 we arrived in Mordor. Pardon, in Ostrava. The country’s “steel heart”. 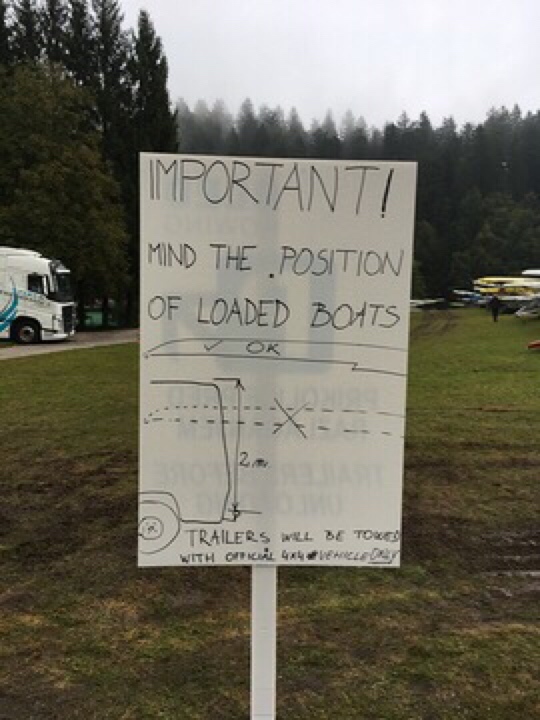 I didn’t want to race, but Vojtech convinced me that I was needed to have a third boat in the Masters 2x category. 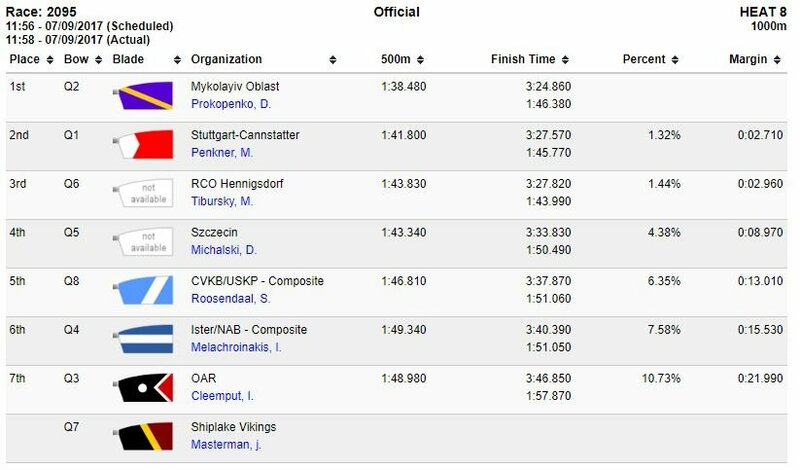 Originally I was scheduled to row with the Ostrava rowing club president, but in the end Vojtech arranged to row with me, which made the race qite unfair. We are much younger than the rest of the field. 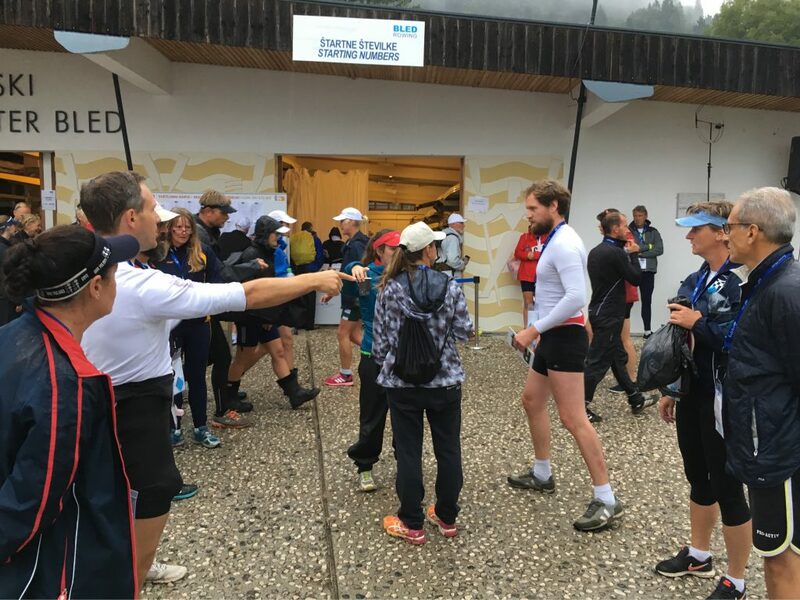 The other doubles asked to row at low pressure and only race the final 200m, but out of the start it seemed to me that they were not holding their promise, so I added some power and that got Vojtech and myself into competitive racing mode. Half way we were leading by a few boat lengths, so I relaxed a bit. A nice row. 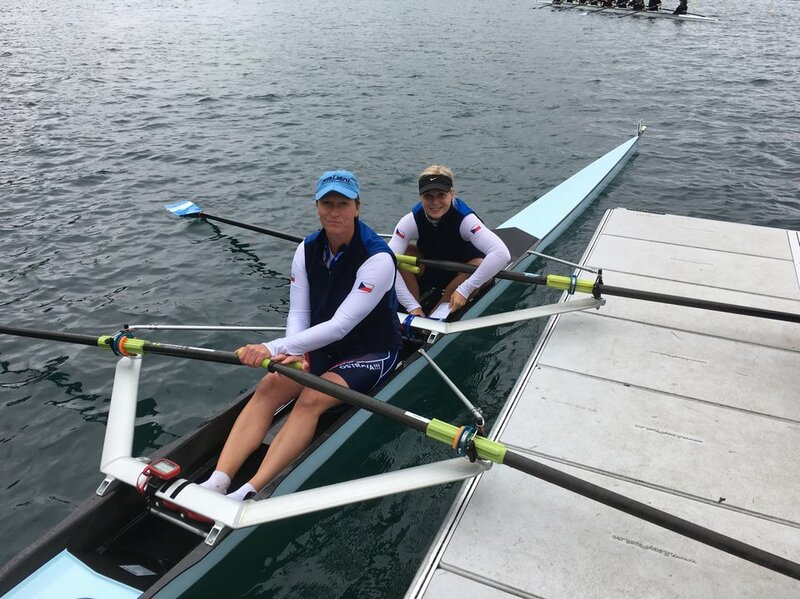 Ostrava have their boats rigged very lightly, so I don’t know if it is that or if we were really rowing well, but it felt great to stroke that Filippi. These are tiny local races. 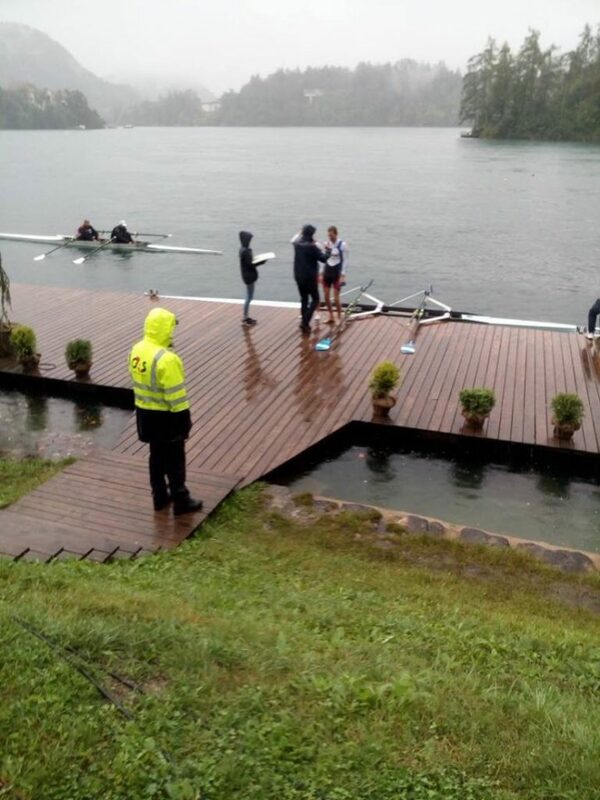 Just one launch, and there was a bit of panic when they were rescuing a flipped sculler and couldn’t start the engine. Lenka won all her races, and Dominik won the single. Only Robin didn’t win anything. He came second after a mid race crash causing him to lose his bow number, the last “2” our club had. Need to buy new bow numbers. Sunday. The last day of racing, entirely devoted to the mixed disciplines, and the day to drive home. 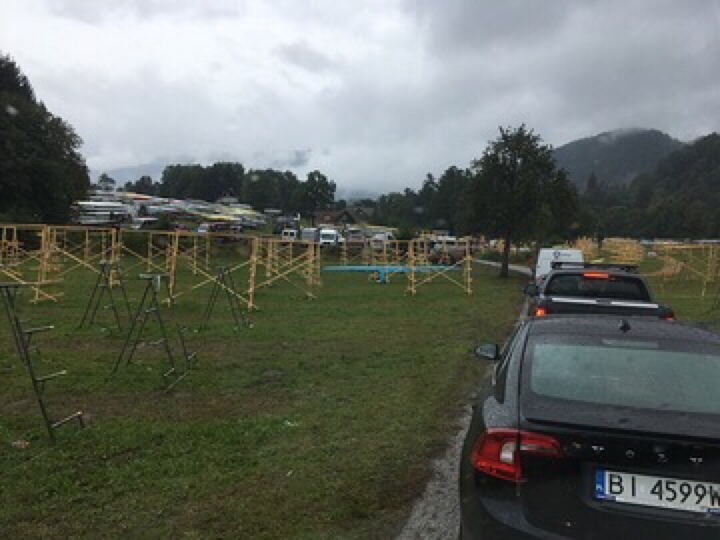 It had been raining all night, but when we rode the bike to the car park close to the rowing center, it was relatively dry. 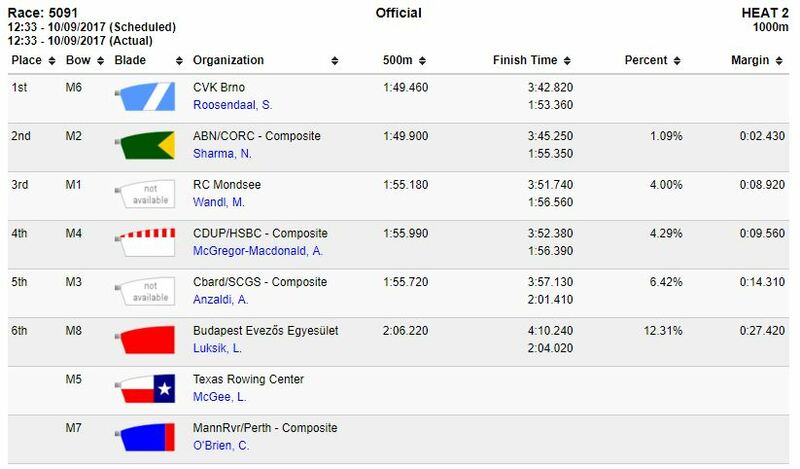 Our mixed double was scheduled for 12:33, but Romana was rowing in a mixed C 8+ with our joyful French friends, in the morning. The same interesting ritual of determining who would row on which side and where to sit, and this time I took pictures of it. I am fascinated by people who, when they see someone taking a picture, snap into ‘funny picture for the internet’ mode, as demonstrated by the cox of the eight. Around 10:30, the weather got worse. The light rain turned into rain, and later into heavy rain. Romana and I spent most of the time in the food tent, drinking coffee and eating donuts. Then, it was time to go. As Romana had already raced, her warming up routine differed from mine, and I really didn’t fancy running in the rain. So I made a change. After changing to race gear and dropping my back at the luggage drop off, I headed to the erg room, upstairs in one of the buildings in the rowing center. I jumped on a RP3 erg and rowed for ten minutes. 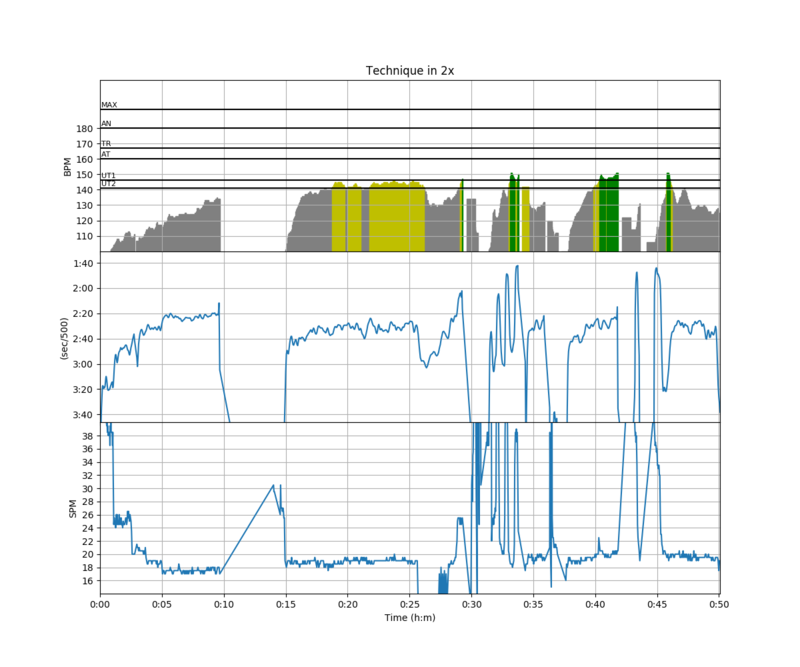 I had no feedback on how hard I was rowing, but my routine was simply ten minutes row with a few speed bursts in the final five minutes. I do like the feel of the RP3. Definitely closer to on the water rowing than the static Concept2 erg. 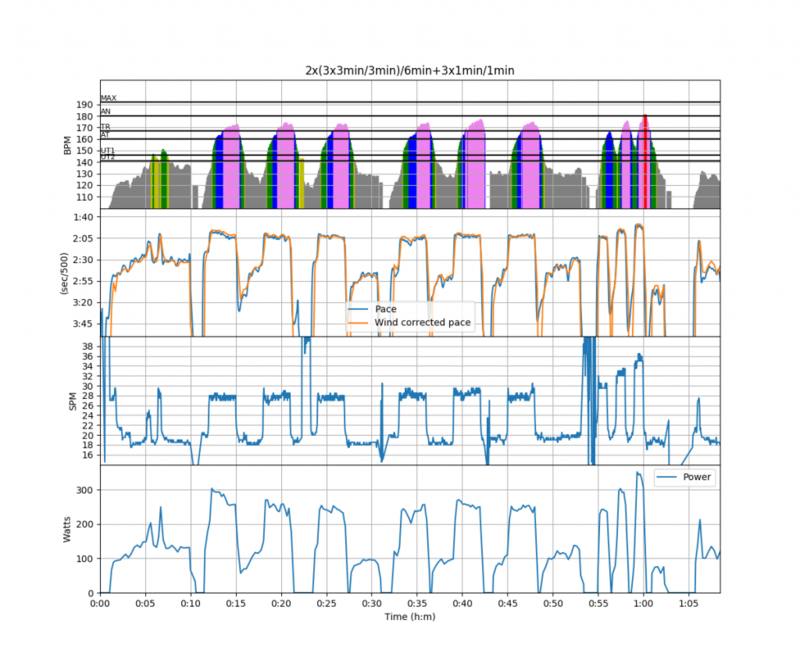 I enjoyed going higher rate and having the direct start of the drive, as opposed to the sloppy catch on a static C2. I even slightly started wanting to own such a machine, but I then reminded myself that I was going to put my money on on the water related gear. I also feel that a C2 on slides is a decent alternative, with the added benefit of using a PM which makes resukts comparable with C2 ergs worldwide. I took a glance at the C2 dynamic in the corner of the gym, but refrained from trying it out for a direct comparison. I grabbed my umbrella and headed out, into the rain. 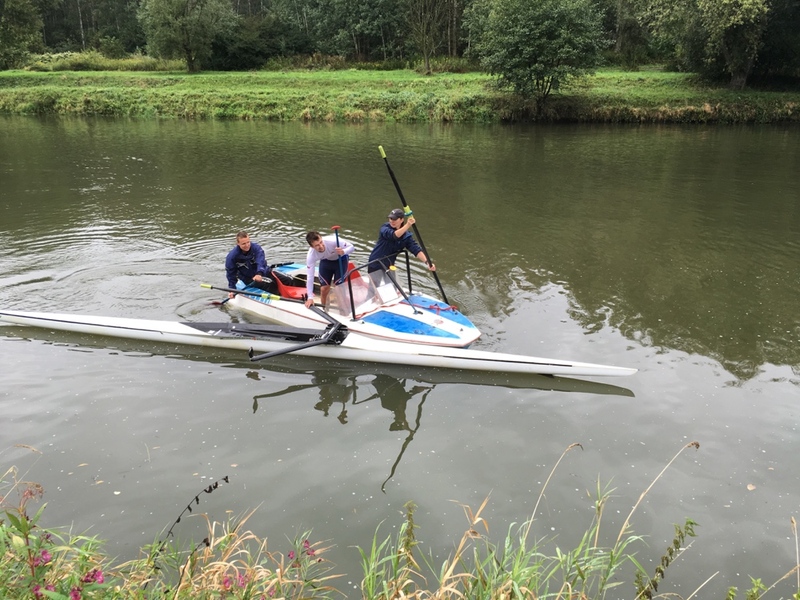 Some friends helped carrying our blades, and just before 12:00 we were on the water. It was raining harder. Luckily, our two loops of warming up kept us warm. We were at the pre start about 15 minutes before our race time and waited. By now it was raining very hard. 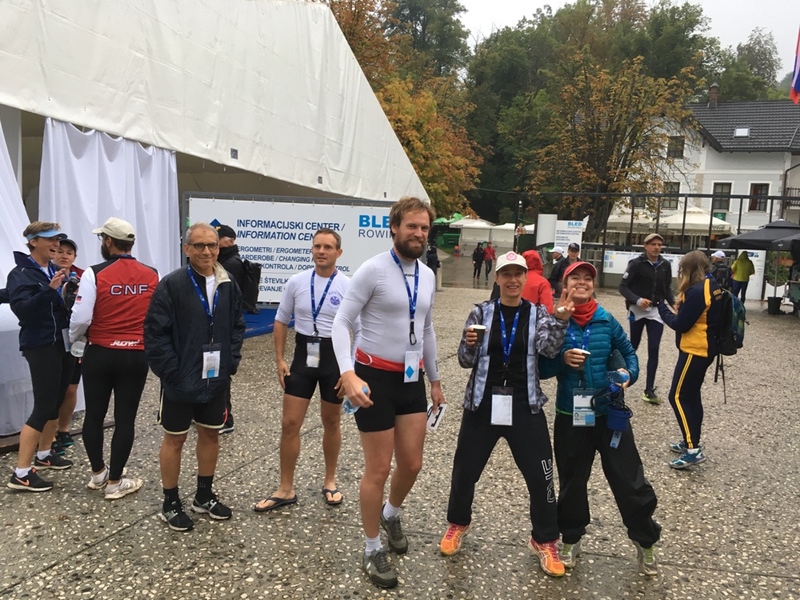 Martin and Jitka, a Czech Masters mixed double who we race on home races, were waiting in the same lane for the race after ours. Jitka is a professional fitness instructor and she does look like you expect a female fitness instructor to look. Including sun glasses planted on forehead. Martin turned around, a big smile on his face, and asked me if we had a hairdryer in our boat. We were all laughing. The joys of mixed rowing. Not long after that, we removed our soaked upper layer of clothing and tucked it away in the boat, where it would absorb the rain water that we had collected. Luckily, we didn’t have to wait for our race to start, because it was chilly in just a uni and a shirt. We were on lane 6 and we didn’t know any of the other competitors. We had a good start. I timed it right, starting the stroke exactly when I saw the starter lowering the flag (which you can spot earlier than hearing the sound of “go”). 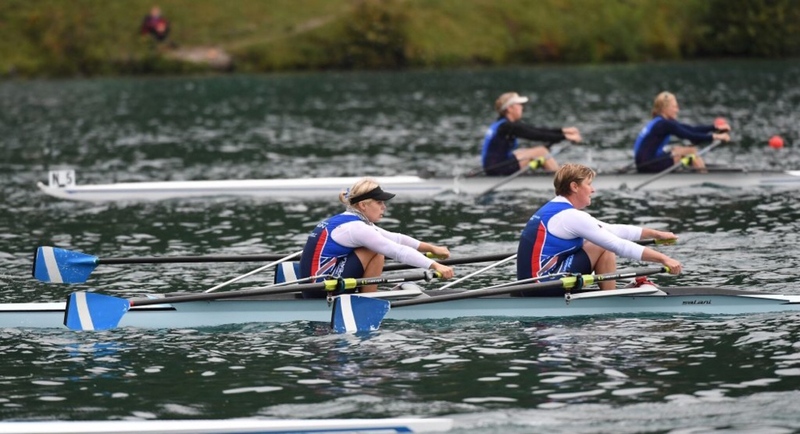 The second start stroke was not ideal but we were there and gaining speed fast. In fact, after about 100 meters, we were in front, with only one boat level with us. With 750 meters to go, Romana’s killer instinct kicked in and she called for a set of power strokes. I rated up slightly (back to 36spm), worried if the pace was sustainable, and we started to pull away slightly from the boat in lane 2 (Abingdon/City of Oxford). That gave confidence, so with 500m to go it was me who called for another power ten, and this time we were able to break them. 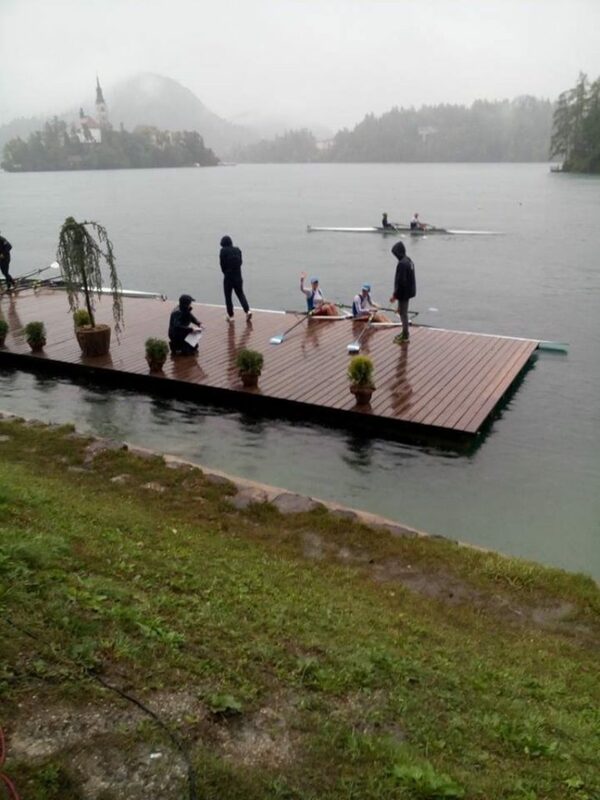 I could see it from how they rowed. They were hurting and mentally accepting a second place. All the while it was raining hard. 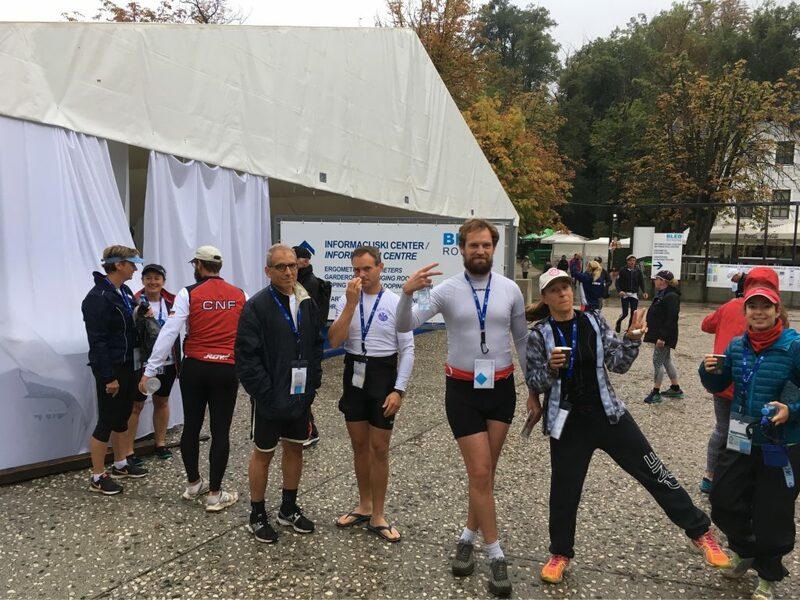 They were not far behind with 250 meters to go and we had to continue rowing hard and avoid mistakes in order to win, but passing the 250 sign I was starting to enjoy the row. 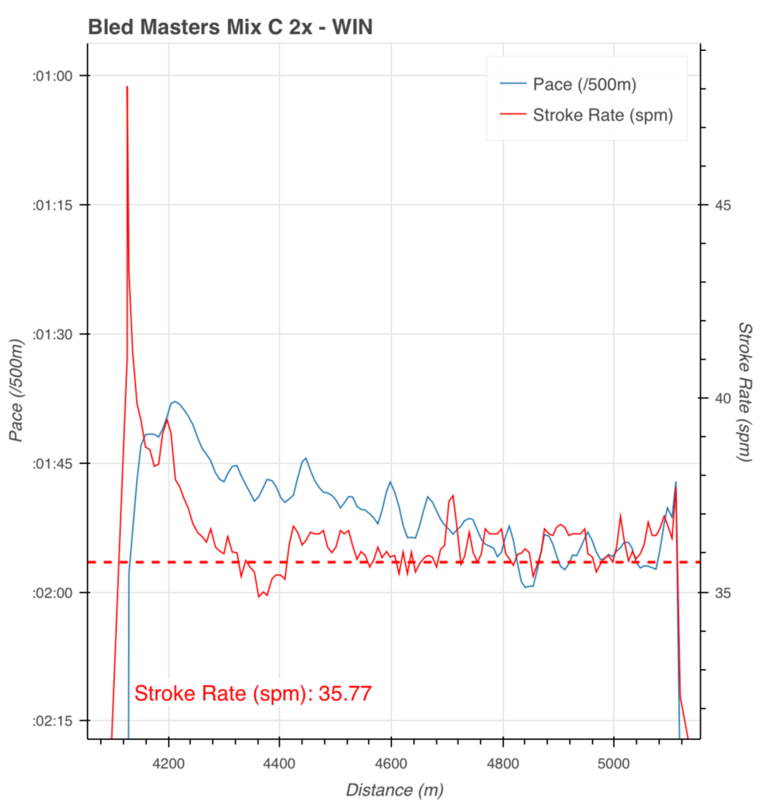 Somehow our stroke had felt rushed for the entire race and I spent a lot of time worrying if I should rate down to go faster or not, but now I didn’t care any more. Perhaps part of the rushed feeling was due to us being super precise at the catch and our stroke just felt fast and light. Crossed the line first! Yay! 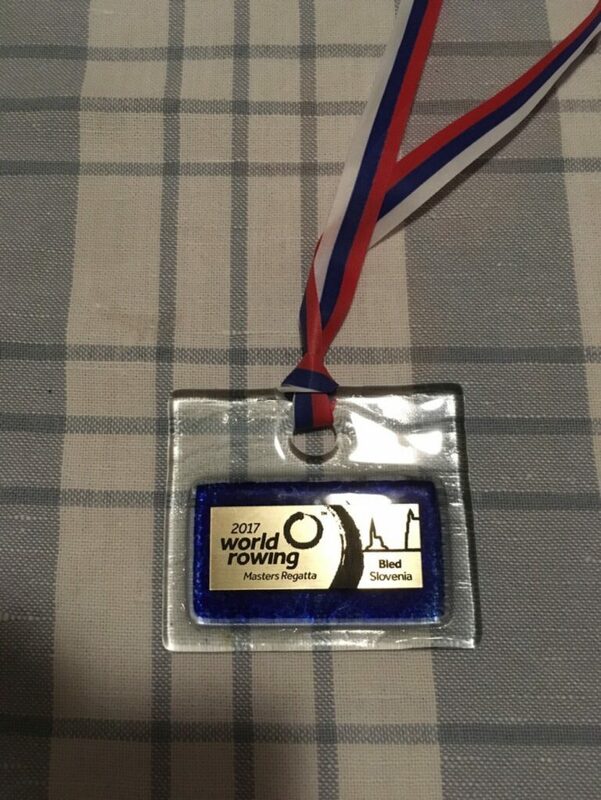 I had heard a comment at the rowing center earlier, from a multi-medalling rower, that mixed races don’t really count, but I disagree with that of course. 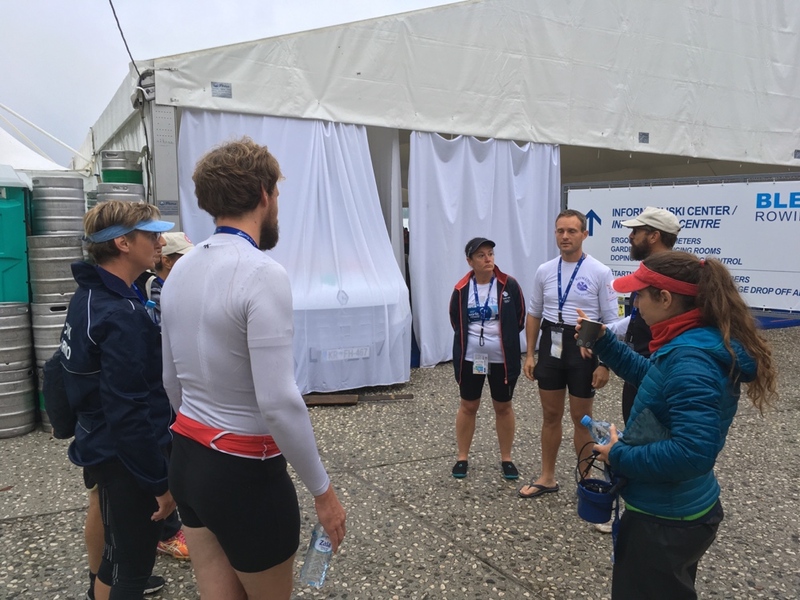 We paddled to the medals ceremony dock where we met Míša and Petr, the Czech winners of the preceding race, and while we were waiting for them to get their medals, Jitka and Martin came by winning their heat by a very small margin. So apart from Karel and Vendula, who withdrew because of Karel’s back problems, the entire Czech Masters mixed 2x crowd won at the worlds. 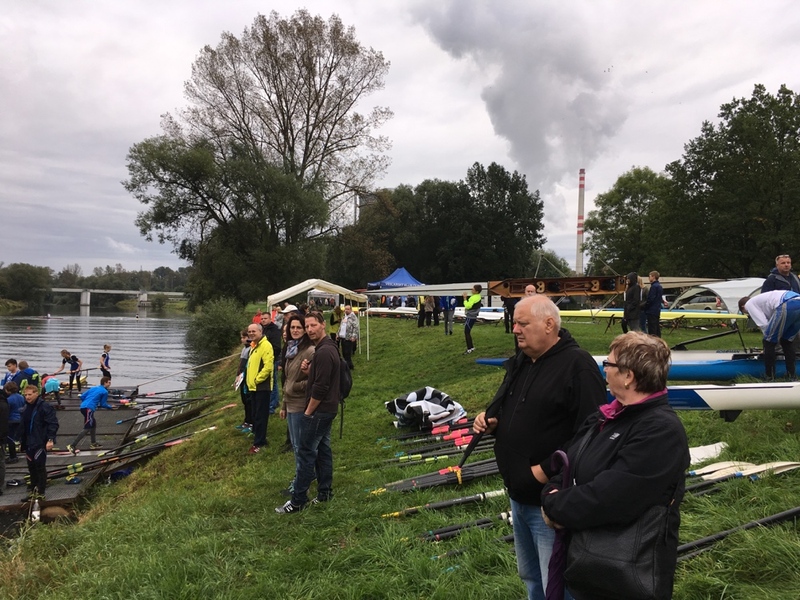 Mixed rowing is popular here and taken very seriously, and it showed. Got the pictures from Darina’s phone. 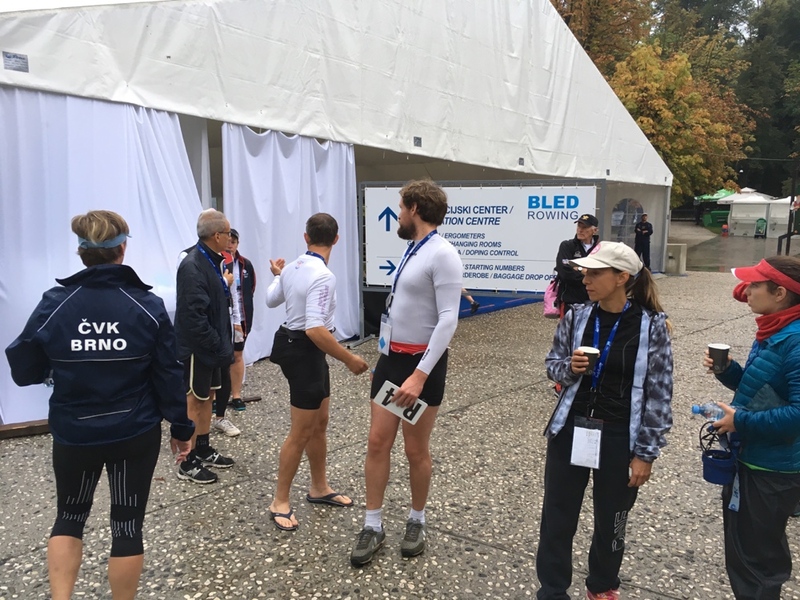 Having received our medals, we paddled back to the rowing center, carried our boat to the end of the boat area (which was quite a challenge in the mud) and put the boat in slings. 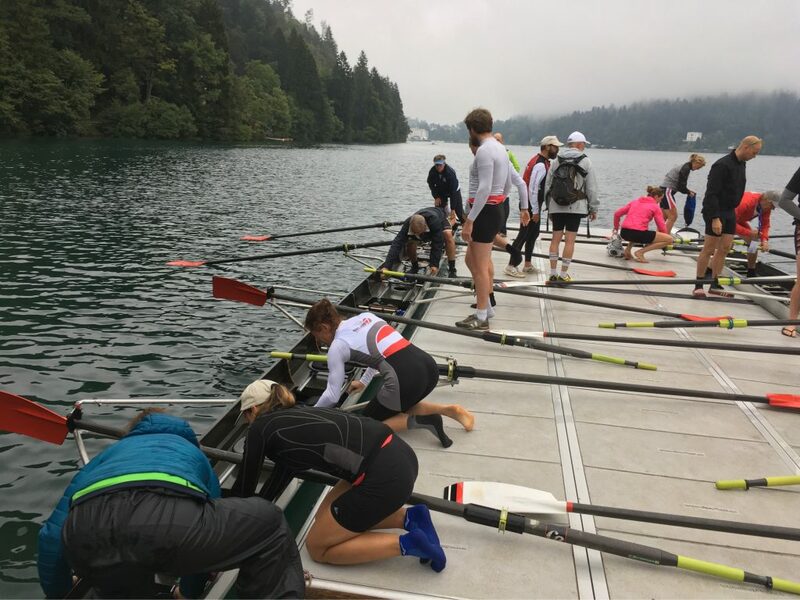 Our club members volunteered to prepare the double for transport, which was great because I was shivering by now. I hurried back to the luggage area, where I received congratulations from our French friends, and then changed into dry clothes. Then I went to the parkking on top of the hill to get our minivan, which had been parked on this muddy meadow for five days. I did make a mistake there. Instead of driving forward, over the sidewalk, onto the road, I backed up and tried to drive across the muddy field to the official exit of the parking. About half way, I got stuck in the mud and couldn’t move the car any more. I talked to the guy in charge of the parking and he was great. He called a friend with a tractor, which arrived about ten minutes later. Just enough time for me to read the manual and find the towing eye. I got to the end of a long queue of towing cars. About two hours later we were seeing our trailer. The issue was thst the trailers were on an extremely muddy field and the organizers had only one 4×4 and one tractor to tow. So it took about ten minutes per trailer. Some people had their towing car in line but their trailer wasn’t ready, causing more delays. We spent three hours in the queue. At 6pm, we departed to Brno. We arrived home at 1am, after a long, rainy, but otherwise uneventful drive. I was in bed by 2am. It was worth it. 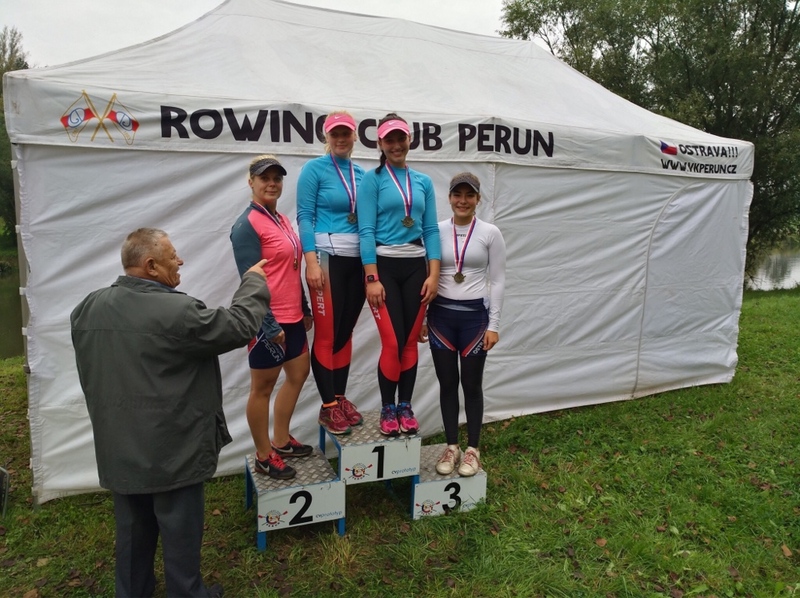 It was a great regatta. I am proud of my two second places in the single. Not bad for a skinny guy like me. I am extremely happy with the mixed double medal. And I had a great time talking to all the people interested in rowing data. 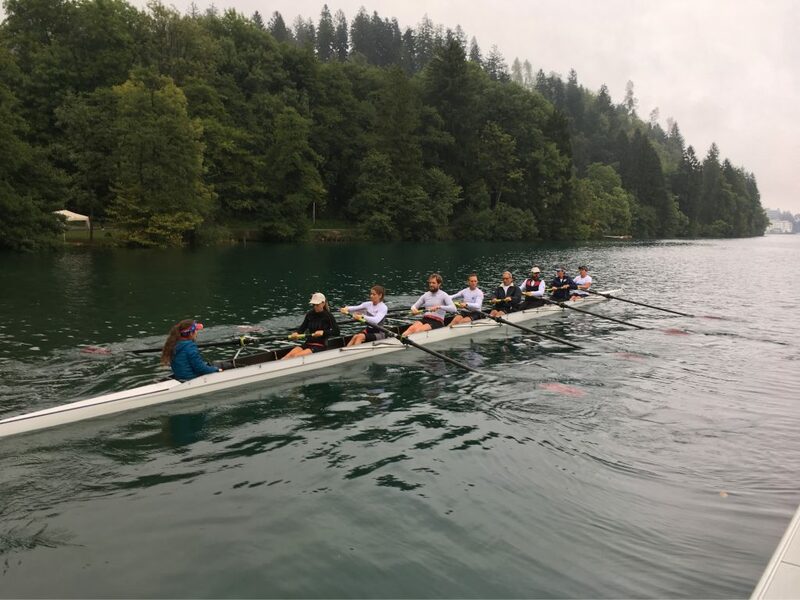 I met s jolly bunch of Frenchmen and got to row the eight. We had very good dinners in the local restaurants and great eveningss at the Bled promenade. No rowing far. On Monday evening, we unloaded the trailer in the rain. On Tuesday I had to work long, and on Wednesday I left for a two day business trrip. I am typing this blog post on the international train Vienna – Warsaw. Tomorrow, I will start fall training. On Thursday, my brother-in-law Tomas and I would race our B 2x race. Tomas had come over the evening before, would race with me and then spend a few days biking in the Alps. When we launched, it suddenly started to become windy, and the lake became a little choppy. We haven’t done many sessions together, but I was hoping that our race experience from Trebon would compensate for that. Unfortunately, it didn’t. Our start was great. This was the only race of the five I did on this regatta where the traffic light system was actually working. I did go off when I “felt” that it would go to green. We were slightly early. The guy on the starting pontoon looked at us in surprise, but the race was started and they didn’t call us back. Rating down to the middle part of the race, we were not able to find a good rhythm. We were fifth, but a few boats were just in front of us. 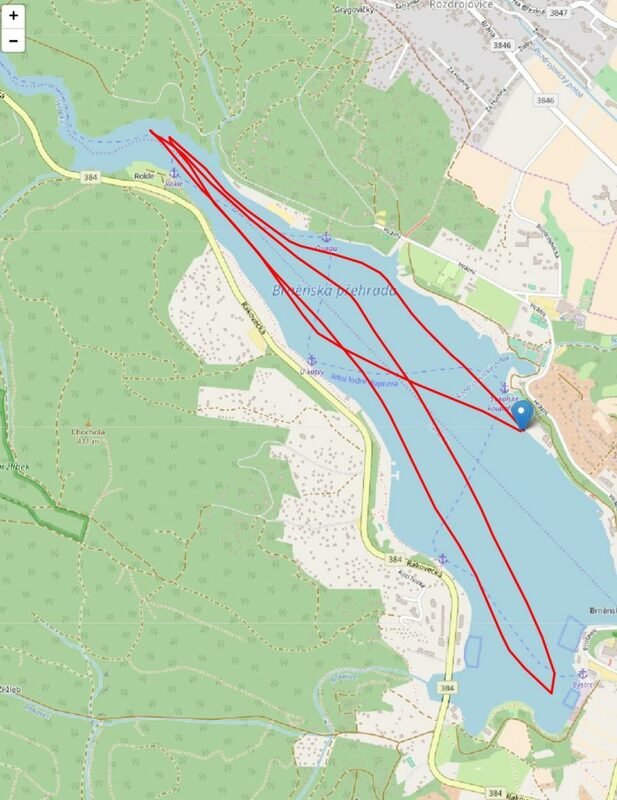 In the second 500m, I had hope that we could pass one or two boats, but unfortunately that didn’t happen. Too bad. Fifth place. Our time was very disappointing. With this tailwind, we should have been able to go under 3:30. We clearly didn’t manage the chop. I thought we were sixth because we beat two boats. According to the official results we were fifth. The Vikings didn’t show up. 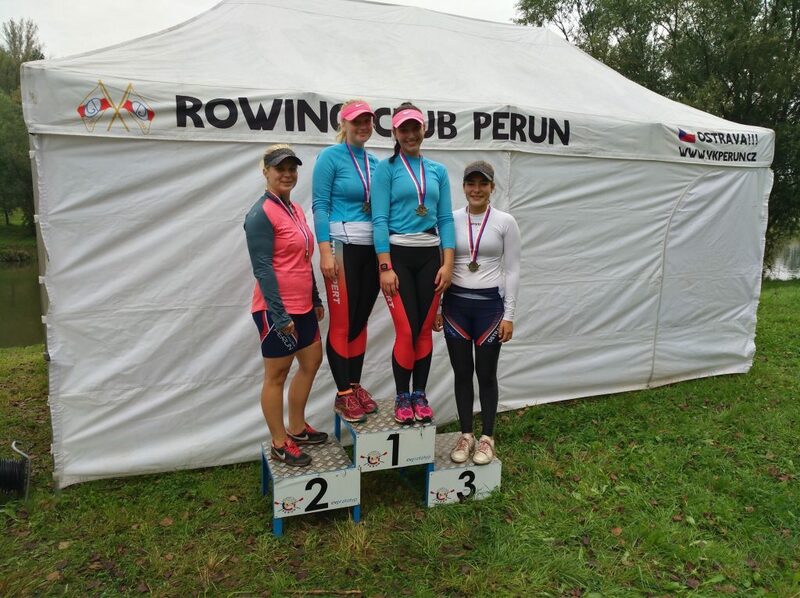 Romana and Veronika rowed the A 2x and were happy with a fourth place. 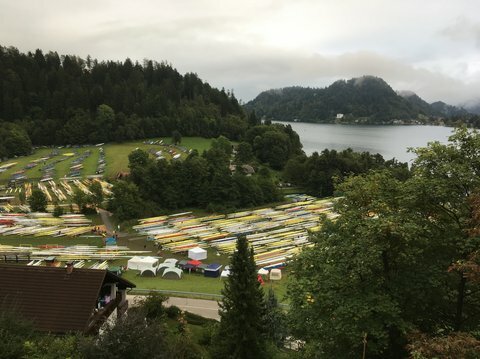 In the evening, I walked up to the Triglav hote, where a small crowd of rowing data fans gathered. Before the talk, I took a picture of the boat area (above) with a million boats. Our boats are not in the picture. They are more to the left. The seminar on data analytics for rowing was a success. I presented for about 30 minutes, and then we talked for about an hour.